The Dovre 280 cast iron electric stove plugs into a normal 13amp socket and you simply use the remote control to turn it on or off, adjust the heat between the 1kW or 2kW settings and select from one of the three flame brightness levels that are created using Dovre’s unique Veriflame™ technology. 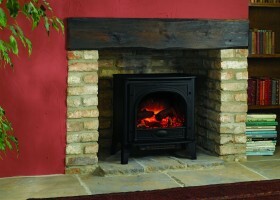 Made from cast iron, this traditional electric stove has exceptionally realistic and hand painted fuel bed and logs. 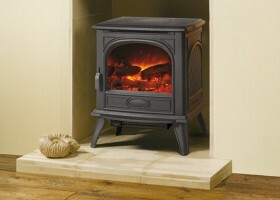 The additional option of a subtle blue flame effect on the highest level makes the electric stove’s log fire one of the most authentic available. It truly is a real fire ambiance at the press of a button.